The County Treasurer is the custodian of all county monies. The present Treasurer is a Certified Treasurer and a Certified Investment Officer, fully trained to invest all county monies as per the Public Funds Act. Works with the general ledger and has internal control within the functions of the office. 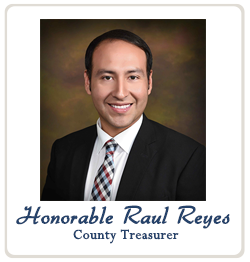 The present Treasurer is the trustee for the Permanent School Land Funds, the Bail Bond Board Funds and is the Escrow Representative of the Webb County Medicaid Upper Payment Account. The present Treasurer has an open door policy and meets with anyone person that comes into this office. Responsible to have a bank depository in place, sends advertisements for bids and analyzes the bids for recommendation to the Commissioners’ Court. •Deductions on employee checks such as Child Support (as per Court Orders) Student Loans as mandated by collection agencies IRS levies on employees Health, Worker’s Comp, and related Cafeteria Plan Deductions Assists all county employees with any information they might need regarding their Federal Withholding deductions, retirement questions and applications, verification of employment. Keeps a complete file for each employee. • Sends W-2’s at year end to employees and 1099s to vendors Retirement, unemployment, health and worker’s comp reports • State Comptroller reports on all fees and fines collected by the County Survey reports and EEO report. Responsible for the paying of all vendors (approx. 80 million dollars yearly), including the entire processing such as keypunching, working with W-9’s for each vendor for the preparation of 1099 forms to IRS at year end. Responsible for reconciling all bank accounts (approx. 74 bank accounts) including investment bank accounts and preparing all necessary journal entries to the general ledger. Works with all departments concerning their bank accounts to monitor their transactions and see if more bank accounts are needed or existing bank accounts need to be closed. Works with departments in overseeing any stale dated checks. Prepares a monthly financial report to Commissioner’s Court and attends meetings.